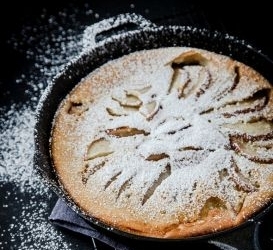 Pear and Chocolate Clafoutis is a Canadian food recipe baked in the oven. Butter a 10 inch cake pan or baking dish with 1 tbsp unsalted butter and sprinkle with 1 tbsp of granulated sugar. Arrange pear slices in a single layer at the bottom of the cake pan. Sprinkle with the chocolate chips. In a large bowl, beat the eggs, sugar, flour, salt, cream and milk until smooth. Pour the mixture over the pears. Bake until golden brown and the pears are tender, or about 35 to 40 minutes. Serve warm or at room temperature with a dusting of icing sugar.